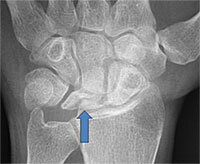 The lunate is the key central load-bearing bone in the wrist, but its blood supply is limited. For reasons that are not completely understood, the lunate can spontaneously suffer disruption of this blood supply without any trauma or fracture. Repetitive stresses may or may not be involved. When the lunate’s blood supply is disrupted the bone dies. This is similar to a ‘heart attack’ of the lunate bone and is called Kienbock’s Disease. Other terms for this bone death are avascular necrosis (AVN) and osteonecrosis (ON), of the Lunate. The dead lunate bone turns ‘chalk-like’, collapses and the wrist develops arthritis. Even before arthritis occurs, Kienbock’s Disease leads to pain, stiffness and swelling of the wrist. Kienbock’s Disease can be diagnosed on X-rays once it is chronic enough to be seen. However, the best way to diagnose early Kienbock’s Disease is with an MRI. In adults, non-operative treatment of Kienbock’s Disease is ineffective. In Kienbock’s Disease without lunate collapse, a simple, minimally-invasive outpatient surgery called ‘Core Decompression’ can be performed. 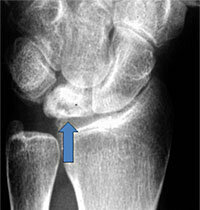 (Wrist Figure 12) Avascular necrosis (AVN, or bone death from the loss of its blood supply) can occur in many different bones. AVN is thought by many to be due to venous congestion. As the veins become congested the pressure within the bone builds because the ‘used’ venous blood within the bone cannot escape. This increased pressure prevents new oxygen-carrying blood in the arteries from entering the bone, similar to how a traffic jam prevents new cars from entering a busy street. 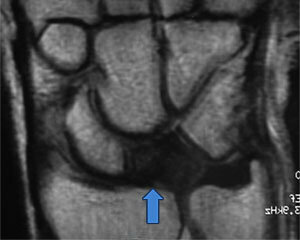 Core Decompression simply removes bone from the Distal Radius, the large wrist bone adjacent to the lunate, and then reinserts it in a much less dense manner. This process leaves holes for the ‘used’ venous blood to exit the wrist, relieving the vascular congestion, decreasing pressure within the bone and allowing arterial blood to enter the lunate. 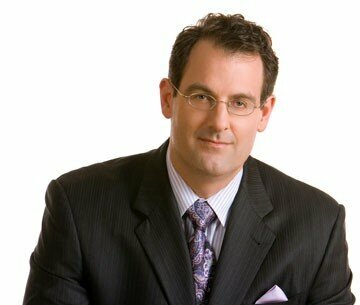 Technically, this is similar to removing bone graft from the distal radius and then reinserting it. Core Decompression provides good pain relief in cases of early Kienbock’s Disease. This is a quick outpatient procedure. Computer use can start the night of surgery. A splint should be worn for 1-2 weeks and heavy activities and sports avoided for 6 weeks. If the lunate has started to collapse from Kienbock’s Disease, then simply relieving the venous congestion is not enough. (Wrist Figure 13) At this point, the most predictable treatment is to shorten the radius. Radial shortening is also an outpatient procedure. A 2-4 mm section of bone is removed from the distal radius and a plate is placed to stabilize the bone as it heals. Depending on how early the collapse is caught, this procedure has a 70-93% success rate; the success rate is better the earlier the procedure is performed. Following surgery, the wrist is immobilized for 1-2 weeks and then Hand Therapy is started. Once arthritis has occurred, a Partial or Total Wrist Fusion will be required to decrease pain. While these procedures do decrease or eliminate wrist motion, they treat the problem and provide pain relief, strength and stability that allow the hand and wrist to function again. Kienbock’s Disease is an enigmatic disorder that is still not completely understood. Nonetheless, effective treatment is available. As for most other disorders, the earlier treatment is provided, the easier it is to treat the condition less invasively and with fewer problems. Kienbock’s Disease without Collapse – Note the increased density of the lunate (arrow).